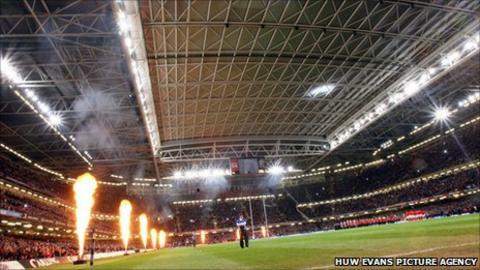 The Millennium Stadium in Cardiff has been confirmed as a venue for the 2015 Rugby World Cup. England were confirmed as tournament hosts two years ago. And the 74,500-seat stadium in the Welsh capital has now been approved by the International Rugby Board. "Our proximity to the west of England and London means the Millennium Stadium makes enormous sense as a venue for these important fixtures." Details of the schedule of matches to be played at the Millennium Stadium will be confirmed when the full tournament structure is announced in due course. Wales had supported England's successful bid to host the tournament and they were chosen ahead of rival bids by Italy, Japan and South Africa in July 2009. The Millennium Stadium was built to host the 1999 Rugby World Cup final, with Australia defeating France 35-12. It also staged four matches during the 2007 tournament, which was hosted by France. "The Rugby World Cup is now one of the greatest tournaments on the sporting calendar and Wales can be proud to be playing a pivotal role in its delivery," added Pickering, who is also Wales' representative on the IRB Council.